Old oxcart for Hina Matsuri, the Japanese girl's festival. 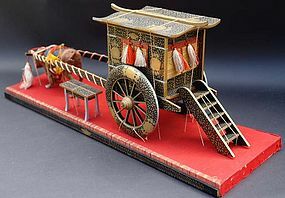 Decorated in makie on lacquered wood, this style of the carriage was used by the aristocrats during the Heian period (I794-1185). This can be displayed with the "shittei (shitei)", three servants dolls and/or other small dolls. The carriage is tied to the stand in original condition which needs to be untied after the shipment. The strings have been putting pressure on the two front legs of the ox. The legs can be easily straightened. The label on the box contains the name of the store in Nagoya city (printed in old characters) with 4 digits phone numbers (11 digits today?). Circa, Taisho to early Showa period, 1920-1940. The dimensions of the box (assembled with wood pegs): 23 1/4" (59cm) x 10 3/4" x 8 1/2" deep.